Feminism stole the show at the recently concluded UN General Assembly in New York. If by now you have not heard that actress Emma Watson delivered a feminist speech which became the most celebrated event during that week of frenzied activities at the UN, you must have taken a short vacation from human civilization to reside in a cave. Emma Watson’s feminist speech is everywhere, its fame rivaled perhaps only by #BringBackOurGirls and the Joseph Kony campaign before it. Facebook trended the speech like the second coming of Jesus Christ. Twitter told it on the mountain, over the hills and everywhere that Emma Watson had taken feminism to heights no one had ever imagined. Not to be outdone, Vanity Fair called it “a game-changing speech on feminism”. The feminist establishment, activist and academic, went gaga, especially here in North America. The usual construction, deconstruction, and reconstruction of the speech started; rethinking of it started; remapping of it started. I followed the rise to fame and incipient theoretical career of the speech with considerable bemusement and amusement. You will know why shortly. I was going to brush the speech aside and return to my daily political preoccupation with the Nigerian tragedy when I received an enthusiastic email from a Nigerian graduate student in the United States. “Prof, have you read Emma Watson’s UN speech? Fantastic, isn’t it? Are you planning to come to the ALA next year? I was thinking we could convene a panel on it. We could examine the theoretical implications of the speech for African feminist discourse”. The ALA, for the reader not in academia, is the African Literature Association, the annual Mecca of those of us in the business of producing knowledges on the literatures of Africa. 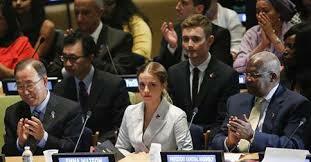 This is the point at which I decide that Emma Watson’s UN speech has become Chinua Achebe’s proverbial leper. Allow him a handshake and he will insist on a bear hug the next time. It is one thing for me to watch, bemused and amused, as the West canonized and proclaimed the speech as the most original line of thinking to have happened in feminism since Simone de Beauvoir discovered in 1949 that one is not born a woman but rather becomes a woman, it is another thing to hear an African drool over its originality, proposing to take it to the ALA to start a new line of thinking in African feminisms. I have spent almost two decades in the Universities of the United States and Canada. I am used to the West constantly proclaiming the originality of some new proposition in the arena of knowledge largely because Western canonizers of knowledge are very much like the child in that Yoruba proverb who, never having visited other people’s farms, screams from the rooftop that his father owns the biggest farm in the world. You go to the disciplines of the Humanities and you see people proclaiming the originality of some idea or philosophy that you heard unlettered farmers espouse every evening over palm wine in your village in Africa when you were growing up. If the West is hearing about it for the first time from a Western source, it is original. Stop bashing men. Include them. Make feminists of them. Gender equality ought to be everybody’s business. Let’s all do “HeForShe”. That is the gist of Emma Watson’s speech. That is what folks are saying they have never heard before. Well, I have. When feminist theory made it to Africa, it ran into troubled waters very quickly with African men and women alike. At the initial phase, Africa had the misfortune of encountering only the most radical strands of Western feminism. This feminism oozed smoke and fire from the centre of its head like one of Fagunwa’s ghomids. It was a very fearful feminism indeed. It tore at everything in Africa and lumped everything together: marriage and motherhood were just as bad as female genital surgery. No African cultural and traditional institution passed muster. This rampaging radical Western feminism looked at the African woman, shook its head in pity, and declared her the most abject, the most oppressed human being it had ever encountered. It then declared that the White Western feminist saviour had landed to rescue African women from their barbaric pagan men and patriarchal institutions. Naturally, this White feminist saviour assumed that the way she experienced gender in her culture was universal. African men panicked and began to blackmail African women who, it must be said, were sympathetic to feminisms. It became dangerous to be labelled a feminist. The tag came to carry all sorts of pejorative meanings. African women, especially the thinkers, recognized the problem of patriarchy and gender inequality in Africa. But they could not see themselves in the agendas and experiences of the White Western radical feminist rampager who had come to save them from marriage, from motherhood, from men. They could not pretend that there were not elements of feminism in traditional Africa which were all thrown overboard by colonialism. After all, gender roles in traditional Africa did not always automatically translate to gender inequality. That I cultivated yams as a man and you dyed indigo for sale in the market as a woman does not intrinsically elevate male farmerhood over female traderhood. Also, African women thinkers could not overlook race – and so many other things. So long as feminism was going to be a radical rampager from the West, the hesitation to embrace it would continue. Three Nigerians found a way out of the epistemological logjam. Eminent writer and feminist thinker, Molara Ogundipe-Leslie, coined the term, STIWANISM, as a way of elaborating an African feminist theory and praxis that would not be open to the charges levelled against radical Western feminist and its intrusion into Africa. STIWA is her acronym for Social Transformation Including Women in Africa. In other words, she was proposing a feminism of cooperation and collaboration which does not bash or antagonize men. She was proposing a feminism which recognizes the complementarity of the two genders while not papering over the real issues affecting women in Africa. She was not alone. Professor Obioma Nnaemeka, a mentor of mine, is arguably Nigeria’s biggest contribution to contemporary feminist thought and critique on the world stage. She it was who came up with another theoretical category called NEGO-FEMINISM. Aunty Obioma was playing on words: “negotiated feminism and no ego feminism”. Nego-feminism also allowed for a praxis of complementarity and inclusion. In fact, she did not spare the rod in the canonical essay in which she introduced this new concept. She went after Western feminists who constantly misread Flora Nwapa, Chinua Achebe and other African writers. The late Catherine Acholonu completed this theoretical troika of African feminisms by suggesting the notion of MOTHERISM. In fact, Acholonu labelled motherism “an Afrocentric alternative to feminism”. She had had enough of the demonization of motherhood in certain radical strands of Western feminism. Motherhood in Africa is a position of strength from which a feminist politics could be articulated. Like STIWANISM and NEGOFEMINISM, MOTHERISM is also a feminism of cooperation, collaboration, and inclusion. Molara Ogundipe-Leslie’s book was published in 1994. Catherine Acholonu’s book was published in 1995. Obioma Nnaemeka also coined nego-feminism circa 1995. But all three thinkers had been discussing these issues long before the 1990s. Stiwanism, nego-feminism, and motherism are not just feminisms of HeForShe, they are also feminisms of SheForHe in conformity with the gender complementarity cultural bases of Africa. African feminist theorists have been writing about these things for decades. They have proclaimed feminisms of inclusion from the podiums of the West since the 1980s. They have published books about these things in Western presses. Yet, folks are salivating over Emma Watson’s speech as if they are hearing these things for the first time. Perhaps this all boils down to Chinua Achebe’s old argument about the necessity of telling our stories in order to achieve a balance of stories. All over Canada, all over the United States, graduate seminar syllabi on feminist theory will be designed subsequently to include “emergent HeForShe” feminist discourses. Students are going to be sent out to hunt Emma Watson’s speech as the source of this paradigm shift by Professors for whom feminist theory does not extend beyond Simone de Beauvoir, Julia Kristeva, Helene Cixous, Luce Irigaray, Judith Butler, Betty Friedan, Toril Moi, Elaine Showalter, and Diana Fuss. If we do not tell our stories, nobody will remember that “HeForShe and SheForHe” feminism is not new. Nobody will remember that the Nigerian thinkers discussed here and their colleagues all over Africa have been screaming this feminism that the West is surprisingly only just discovering via Emma Watson for decades. The invitation extended to men by the actress was extended by African feminisms to men in the 1980s and 1990s. It remains an open invitation. The Facebook and Twitter career of Emma Watson’s speech has been aided by hundreds of thousands of young African netizens who have been sharing it enthusiastically with the obligatory rider about how original and refreshing it is. These kids, especially the Nigerians among them, have never heard of Obioma Nnaemeka, Molara Ogundipe-Leslie, and Catherine Acholonu. They do not know that what they are attributing to a British actress on a UN podium in New York are ideas patented about the time they were being born in the 1980s and 1990s by three great Nigerian feminist theorists. And that, my friends, is part of the tragedy of Africa. Pius Adesanmi is an award-winning poet, writer and academic. He is a public intellectual as well as a Professor at Carleton University, Canada. His non-fiction book, ‘You are Not a Country, Africa,’ won the 2010 Penguin Prize for African Writing.